It’s hard to find luxury vehicles that truly stand out these days, especially when you slide behind the wheel. The 2017 Mercedes-Benz E-Class, however, takes luxury vehicle interiors to a whole new level, with natural elements, ultimate comfort, and plenty of extra features. From wood finishes to massage capabilities, the newest E-Class truly outshines its competition. Before you head to RBM of Alpharetta to tour the cabin yourself, learn more about what’s in store. The 2017 Mercedes-Benz E-Class is utterly luxurious throughout the entire cabin, and it incorporates natural elements for a relaxed, soothing effect. You’ll find sweeping woods and 64-color LED ambient lighting, as well as a sunroof that lets natural light right into the vehicle. There’s no doubt that you’ll feel entirely at ease every time you slide behind the wheel. Comfort and convenience are the name of the game with the 2017 Mercedes-Benz E-Class, and its interior reflects that in many ways. All models boast dual-zone automatic climate control, for example, along with premium synthetic leather upholstery and power-adjustable front seats. The rear bench splits 40/20/40 so that you can optimize your space for cargo and passengers, and a navigation system gets you where you need to be. What’s more, there are various interior setups from which you can choose: a five-passenger midsize luxury sedan, a seven-passenger wagon, and a four-passenger coupe or convertible. The Premium 1 package guarantees a wireless phone charger and keyless entry, along with heated front seats. The Premium 2 package makes sure you’re nice and cozy on every ride with front seats with massage functionality, as well as a perfumed air freshener system for pleasant scents at all times. The Premium 3 package’s highlight is a head-up display, which allows you to review vital information directly projected onto your windshield so that you can avoid taking your eyes from the road. Take your pick to make your Mercedes-Benz E-Class model your very own. 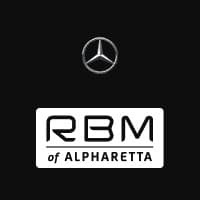 The 2017 Mercedes-Benz E-Class interior is truly unique, and there are plenty of options available to you when you shop the inventory at RBM of Alpharetta. Our dealership can guide you through your options, take you out on a test drive, and arrange financing packages, making the car-buying process a complete breeze. Don’t hesitate to reach out if we can answer any questions before you visit!